MINNEAPOLIS (AP) Happy birthday, Karl-Anthony Towns. Here’s a brand-new win over the San Antonio Spurs. 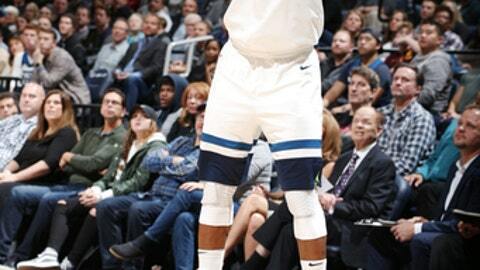 Towns had 26 points and 16 rebounds for Minnesota on the night he turned 22, and the Timberwolves stopped a 12-game losing streak to the Spurs with a 98-86 victory on Wednesday. ”The food will taste better tonight, and the laughter will be even more,” said Towns, who vowed before the game in a conversation with coach Tom Thibodeau that the Wolves would finally stop their slide against the Spurs. Jeff Teague pitched in 16 points and six assists, and Nemanja Bjelica added 11 points off the bench as the Timberwolves put together one of their most complete performances with their fewest points allowed this season. ”They’re good. They’re athletic. They’re skilled, from top to bottom,” said Spurs star LaMarcus Aldridge. The Wolves used a 13-3 fast-break scoring advantage to stave off the Spurs despite a minimal contribution from stars Andrew Wiggins and Jimmy Butler, who shot a combined 6 for 24 from the floor. With strong on-the-ball pressure and quick recoveries and rotations on defense, the Wolves held the Spurs in check. Aldridge was in foul trouble after his 32-point game at Dallas the night before, finishing with a quiet 15 points and 10 rebounds. Rudy Gay shot just 3 for 8 off the bench for seven points. Pau Gasol finished with an efficient 13 points, eight rebounds and four assists, but he had trouble keeping Towns away from the rim. With stars Kawhi Leonard and Tony Parker yet to play this season, both because of quadriceps injuries, and the Spurs on the second half of a back-to-back set of road games, this was a prime opportunity for the Wolves to finally beat them. Their body language suggested a determination to assert themselves in this long-lopsided series, displayed with a wince of disappointment or a look of agitation after a basket by the Spurs they felt could have been prevented. Even Teague, in his first season with the Wolves, had a 13-game losing streak to the Spurs, dating to his rookie year with Atlanta. The last time the Wolves beat the Spurs was on April 8, 2014. ”If we want to be the team we want to be, we’ve got to go against them and we’ve got to go past them in seven games,” Towns said, alluding to the postseason. The Spurs in that month-ago season opener were the only previous opponent to hold Minnesota under 100 points this season, and the Wolves got off to a wobbly 7-for-26 shooting start before they caught fire. They knocked down 12 straight shots at one point, on their way to outscoring the Spurs 39-19 in the second period. Tyus Jones, part of another quality performance by the second team, assisted on three straight baskets by Towns during one stretch with their two-man game in a groove. Teague turned a steal into a 3-pointer for a 51-41 lead, their first double-digit edge of the game, and finished the first half with a runner at the buzzer that rolled off the front rim and in to make it 57-43. ”Guys competed and tried to give ourselves a chance, but I thought we had some key breakdowns at bad times,” Aldridge said. The Spurs never came closer than five points after the 4 1/2-minute mark of the second quarter. Towns started the fourth period with a 3-pointer for a 78-65 advantage, and he sank another one from the top of the key with 4:17 remaining to push the lead back to double digits at 89-78. Towns is in the top 10 in almost every statistical category in NBA history compiled prior to the player’s 22nd birthday. He ranked eighth in points, third in rebounds and second in double-doubles (124), trailing only Dwight Howard (169). This was the eighth time in 14 games this season that Towns totaled at least 20 points and 10 rebounds . Timberwolves: Backup center Gorgui Dieng missed his third straight game with a sprained right index finger. Spurs: Host Oklahoma City on Friday night. Timberwolves: Play at Dallas on Friday night.